1. At a news conference Friday in Eugene, Oregon, before Saturday’s line-up of events at the 42nd annual Prefontaine Classic, the question went out to Aries Merritt, the 2012 London men’s 110-meter hurdles champion who is also the world record-holder, 12.8 seconds, in the event: on a scale of one to 10, where did he fall? Heading toward the U.S. Trials in a month and, presumably, beyond to the Rio 2016 Summer Games, Merritt has probably the most unbelievable, incredible, authentic story in track and field. He had a degenerative kidney condition. With almost no kidney function, he somehow won a bronze medal in the hurdles at the 2015 world championships. Thereafter, with his sister as the donor, he underwent a kidney transplant. It required not just one but two surgeries. So — one to 10? “Ten,” he said. Which means that the hurdles, always one of the best events at the track, figures to be that much better. And, America and beyond — get ready, via NBC and every outlet out there, for the Aries Merritt story. He deserves every bit of good publicity he gets. 2. With all due respect to the sainted Steve Prefontaine — no snark or sarcasm intended, only a full measure of respect — a significant chunk of the problem with track and field in the United States is Steve Prefontaine. Every sport needs heroes. Not just legends. The elements of the Prefontaine story have been well-chronicled: the U.S. records at virtually every middle- and long distance event, the fourth in the 5k at the Munich 1972 Games, his life cut short in a car crash at 24. The legend of Prefontaine, and appropriately, has had a longstanding hold on the U.S. track and field imagination. But imagine if, say, baseball was stuck in the Roberto Clemente era. Or the NBA fixated on Reggie Lewis, Len Bias, Malik Sealy or, for that matter, Drazen Petrovic. Or the NFL on Junior Seau and others. One of the major challenges with track and field now is that there is no 2016 version of larger-than-life Prefontaine. No one is that guy (or that woman). Ashton Eaton could be and maybe should be. But who else? Merritt? It's anyone's guess. Most Americans, asked to name a track and field star, will answer: Carl Lewis. It has been roughly 20 years since Lewis made any noise on the track itself, more than 40 since Prefontaine was alive. Meanwhile, fourth-graders all around the 50 states can readily debate (pick one) Peyton Manning or Tom Brady, whether Derek Jeter was the best Yankee ever, whether they would start an NBA team with (pick one) LeBron James or Steph Curry. Every sport, to repeat, needs heroes. Not just legends. 3. Earlier this year, the former 800-meter world champion Caster Semenya made even hardened track geeks go, whoa. She raced, and won, three events — on the same day — at the South African national championships, the women’s 400 (personal-best 50.74), 800 (1:58.45) and 1500 (4:10.93, outside Olympic qualifying time). So much for the theory — oft-advanced by track freaks who never bother to, say, watch swimming — that a world-class athlete can’t race, and win, multiple events on the same day. From start to finish, Semenya ran the three races in about four hours. She went 1:58.26 to win the Doha Diamond League meet in early May, winning by nearly an entire second. On Sunday, and she wasn’t even really going all out, Semenya ran 1:56.64 for the win at the first IAAF Diamond League meet in Africa, in Rabat, Morocco. She won by more than a full second. For comparison: on Friday night, on Day One of the 2016 Prefontaine Classic at historic Hayward Field, American Alysia Montaño-Johnson won the women's 800 in 2:00.78. Semenya doesn’t deserve to do anything but get to run, and run as fast as possible. At the 2009 world championships in Berlin, she ran away with the 800, in a crazy-fast 1:55.45. Then it was disclosed that she had elevated testosterone levels. The gender testing — and, more, the shaming — that she endured thereafter proved unconscionable. The rules are the rules. The rules say she can run in women’s events. The real question is: what should be the rules? Because it’s perhaps not that difficult to explain why Semenya is — after silvers in the 800 at the 2011 worlds and 2012 Olympics and then injuries and subpar performances since — running so fast again now. It’s all about testosterone levels. Because of Semenya, track and field’s international governing body, the International Assn. of Athletics Federations, as well as the International Olympic Committee, put in place a new policy: you could run in women’s events if your testosterone levels fell under a threshold of 10 nanomoles (that’s what it’s called) per liter. In scientific jargon: 10 nmo/L. Context: as the South African scientist and writer Ross Tucker points out in a brilliant Q&A on what is called “hyperandrogenism” with the activist Joanna Harper, 99 percent of female athletes registered testosterone levels below 3.08 nmo/L. From the science department, part I: “hyper” is science talk for what in ordinary speech might be described as “way, way more.” The primary and probably most well-known “androgen” is testosterone. Part II, simple math: the upper limit of 10 is more than three times higher than for 99 in 100 women. Last year, in a decision that pleased human rights advocates but left knowledgable track observers puzzled (to say the least), sport’s top court, the Swiss-based Court of Arbitration for Sport, ruling in the case of sprinter Dutee Chand from India, said the IAAF (and IOC) could no longer enforce the testosterone limit. In real life, and particularly as we look toward Rio, this means what? The IAAF and IOC are trying to come up with a new policy. Tucker is right. The debate — calm voices only, please — needs to be held, and in short order. 4. UCLA, per a report first from ESPN, landed the biggest college sports apparel deal ever, with Under Armour. Terms: 15 years, beginning in July 2017. The deal is believed to be worth $280 million. Biggest-ever is likely to be relative, depending on what comes next. Texas, 15 years, Nike $250 million. Ohio State, 15 years, Nike, $252 million. Boosters of these schools, and others, typically tend to react with glee at these sorts of numbers. Rhetorical question, part I: why, when USA Track & Field chief executive officer Max Siegel scores a $500 million, 23-year deal with Nike, do some number of track fans bemoan Nike’s influence as a death star of sorts and claim the federation is verging on stupidity if not recklessness? Rhetorical question, part II: how is it that dismissive claims about the USATF/Nike deal become gospel among the disaffected when track athletes actually get paid to run for a living but college athletes, as UCLA quarterback Josh Rosen noted in a Tweet that quickly got deleted, don’t — and likely won’t —get to see a dime of any of those millions? Just a thought here: maybe Siegel was, you know, ahead of the power curve. Many, many things could be said here about Leach and the conduct that led to this action. This is a movie whose ending we can all know, and now. What’s at issue, at the core, is a power struggle between the volunteers and professional staff. Here’s news: the professional staff is going to win. As it should. It used to be that the U.S. Olympic Committee found itself consumed by precisely this sort of petty, personalized politics. That changed when governance reforms became real; when the board empowered the chief executive to run the show; and when the chief executive proved professional and hugely competent (USOC: Scott Blackmun, USATF: Siegel). It's a fact that USATF has a long and contentious history. But this is a fact, too: Siegel's first four years have shown dramatic, and consequential, improvement for the federation, and the sport. 6. Moving along, to an international sports federation president who also gets it, even if the IOC often doesn't want to admit so: Marius Vizer, president of the International Judo Federation. Vizer, in advance of the start Friday of a major IJF event in Guadalajara, Mexico, spent about two hours doing a live Q&A on Twitter. Imagine: actually doing exactly what the IOC says it wants to do, to reach out to young people in those ways, like Twitter, by which young people connect with each other. Far too many federation presidents might have something resembling a panic attack at the thought of entertaining questions about whatever from whoever. Vizer, who has never had anything to hide and has consistently been a forceful voice for accountability and change (to the IOC's chagrin), made it plain: bring it on. Indeed, Vizer ended by saying more such Q&A's would be forthcoming. If you might be tempted to look past those potentially significant developments related to the allegations of Russian doping — first, a potential U.S. Justice Department inquiry and, second, U.S. Anti-Doping Agency chief Travis Tygart’s bombshell of an op-ed in the New York Times — it was otherwise a good week for the LA24 bid committee, at least for those things it could and can control. Los Angeles, behind a bid headed by Casey Wasserman, who is also in charge of LA24, won the right to stage the 2021 Super Bowl. Plus, a rail line from downtown to Santa Monica opened, to real excitement and big crowds. Roll that around in your head: LA. Rail. It’s real. Really. 8. Still a long way to go in the 2024 race, which the IOC will decide by secret ballot in September 2017 at a meeting in Lima, Peru. Three others are in the race: Paris, Rome, Budapest. It’s a proven that what wins Olympic elections are, first, relationships, and two, telling a story that will move IOC members emotionally. Right now, only two of the four are telling a real story: Los Angeles. And Budapest. The Japanese Olympic Committee announces a three-person investigation of allegations of bribery. This from the same place that brought you the burning of the Nagano 1998 books so as to avoid embarrassing the IOC. Let’s all wish for really good luck in getting a genuine answer. Why in the world would you need to send $2 million to Ian Tan Hong Han, a consultant based in Singapore, who is close friends with Papa Massata Diack, son of Lamine Diack, the then-president of the IAAF, when virtually no one in the Singapore international sports community knew of Han or his firm, Black Tidings? Black Tidings had precisely what know-how to provide such high-level consultancy services? More: those who were there for the Singapore 2010 Youth Games know there had to be external help when Singapore was bidding for YOG. Curious. 10. Russia uses sports as an instrument of what’s called “soft power,” meaning president Vladimir Putin has sought to use sports to project a Russian image of strength, not only abroad but, crucially, within Russia itself. The United States, which under President Obama has clashed with the Kremlin over issues ranging from the disclosures of the activist Edward Snowden to the composition of the formal U.S. delegation to the Sochi 2014 Winter Games, has if not unparalleled then at least significant resource available to its spy agencies. How is it that Sochi 2014 lab director Gregoriy Rodchenkov could flee Russia and end up so quickly in the United States? No one in the American spy apparatus would want to embarrass the Russians, would they? 11. What a surprise! The London 2012 doping re-test positives became public on a Friday! More numbers, 32 doping cases from London 2012, 57 for Beijing 2008. Previous high, according to IOC figures: 26, Athens 2004. To reiterate a central point: you have to be frighteningly stupid to get caught doping at the Olympic Games themselves. It’s one thing to be caught in no-notice, out-of-competition testing. But at the Games? You know there are going to be drug tests. You know the samples are going to be kept in the freezer for (at least) 10 years to allow for advances in testing. It has been said many times but is still worth repeating: failing a drug test at the Olympics is like failing an IQ test. 12. If you’re thinking of going to Rio, don’t. Sorry to say so but — don’t. Watch on TV. The pictures will be beautiful and the only danger in overloading on TV is breathing in that funky orange-red Doritos powder. Who wants that? Be a master of your TV universe. There are lots of ways to look at the performance of the U.S. team at the just-concluded Sochi 2014 Winter Games. The American team won 28 medals, nine gold. The optimist says that’s great. The realist says the U.S. not only could have done better but almost surely should have. The International Olympic Committee added 12 new events to the 2014 program, mostly in the so-called action sports, and in those 12 Americans won nine medals. So — what happened around so much of the rest of the team? Sochi marked the best U.S. performance at a non-North American Winter Games. Those 28 medals were second only to the host Russians, who won the overall count with 33. Nine tied the mark set in Vancouver four years ago for most-ever gold medals at a non-domestic Games. The U.S. team won 10 in Salt Lake City in 2002. Mikaela Shiffrin, just 18, won the first gold medal in women’s slalom skiing in 42 years. Ted Ligety won the men’s giant slalom under extraordinary pressure. The two-man bobsled team, Steve Holcomb and Steve Langton, won the first medal of any color — in this instance, bronze — in 62 years. Holcomb would later drive the four-man sled to another bronze. Joss Christensen, Gus Kenworthy and Nick Goepper swept the Olympic debut of slopestyle skiing. That marked only the third time U.S. men have swept the podium at the Winter Games. The prior occasions: figure skating 1956, snowboard halfpipe 2002. Starting from the exact same place: 28 medals, nine golds, and comparing that with Vancouver: 37 medals, nine golds. Should going to Russia instead of just across the border to Canada make so much difference? If before the Games Americans would have been a known lock for nine medals in the 12 new events, experts in some circles would not have found it unreasonable to have predicted 40 medals overall for Team USA. How, then, to appropriately assess 28? The entire U.S. Olympic Winter team did not win as many medals as the U.S. track and field team did in London in 2012. The track team won 29. For that matter, the U.S. 2012 swim team won 31. Overall, there were 98 medal events at the Sochi Games. One potentially very useful metric is how many medal opportunities there were — that is, available spots for Americans to earn a medal. It’s not a simple case of multiplying 98 times three (the number of medals per event). In some events there might only be one American available to earn a medal; in others, several. Bottom-line: there were, by the end of the Games, 255 medal opportunities. Again, American athletes earned 28 medals. That’s a return rate of 10.98 percent. Perhaps this, then, might offer the best measure of the 2014 U.S. team’s performance: is a return rate of 10.98 percent good, or can it — or better yet, ought to be — improved upon? For comparison, the London track team’s return rate: 29 of 143, or 20.3 percent. The gold standard is the 2012 U.S. swim team: 31 of 62, or 50 percent. Of the nine gold medals, five came from new events; four from events that had been on the program before 2014. As pointed out by Law Murray, a graduate student at the Annenberg journalism school at the University of Southern California who was a credentialed reporter at the Games, all nine of the gold medalists are under age 30. Much of the pre-Games media attention focused on veterans such as snowboarder Shaun White and speedskater Shani Davis. Neither medaled. As Murray also noted, of the 20 individual medalists, 14 won medals for the first time in Sochi. Only the 20 new medalists from the 2002 Salt Lake Games exceeded that number. The USOC looks at all these kinds of things, and more. It has two fundamental priorities. One, win medals. Two, inspire the American public. The inspiring depends on the medals. This is the mission. And the mission, so it’s clearly understood, can involve some serious money. Strictly speaking, the USOC does not, in the manner of a traditional American business, seek ROI, or return on investment. But — when you are laying out $2,724,345 to US Speedskating, as the USOC did in 2012, the year for which disbursements are most recently available, according to the USOC’s tax returns, and the long-track team goes oh-for-Sochi, it’s reasonable to launch a far-reaching inquiry. As first pointed out by Gary D’Amato of the Wisconsin Journal-Sentinel, the U.S. long-track team’s medal count since 2002 has gone like this: eight, seven, four, zero. That belies an institutional problem that, finally, exploded into the public domain in 2014. USOC chief executive Scott Blackmun said last Saturday, “If you look at the speedskating results, we weren’t the only nation that got smoked,” the Dutch taking a torch to the rest of the world. Another program that figures to invite scrutiny: the figure skaters won a bronze in the new team event, true, but left Sochi without a medal in men’s or ladies’ singles for the first time since 1936. That is, in a word, unacceptable. The USOC, according to its tax statements, gave the U.S. Figure Skating Assn. $842,486 in 2012; $866,966 in 2011; $1,023,025 in 2010. The United States produced the men’s gold medalist in 2010, the women’s silver medalist in 2006 and gold medalist in 2002. Now? The last U.S. woman to medal at an Olympics or world championships — in an Olympic year, the worlds come after a Games — is Kimmie Meissner, who won the world championship in 2006. Since 2010, no U.S. man has finished higher than seventh at the Olympics or the worlds. The ladies’ free skate, traditionally a highlight of the Games, attracted 20.3 million viewers, as Russia’s Adelina Sotnikova won gold over South Korea’s Yuna Kim amid controversy. The comparable night in Torino, when American Sasha Cohen won silver, drew 25.7 million. That is 5.4 million fewer people, a drop of 21 percent. The U.S. men’s hockey team came to Sochi proclaiming “gold or bust,” beat the Russians in one of the Games’ most dramatic moments and then, in a 5-0 bronze-medal loss to Finland, proved they really meant it — it really was gold or time to go into the tank. “We didn’t show up. We let our country down. That’s it,” forward Max Pacioretty was quoted as saying in the Los Angeles Times. There were high hopes this might be the breakthrough year for both cross-country skiing (no medals since 1976) and biathlon (no medals, ever). Didn’t happen. Lindsey Vonn did not ski in Sochi because she was hurt. In 2010, she won two. The Nordic combined team, altogether, won four in 2010. In Sochi, zero. The long-track team, in Vancouver, four. In Sochi, zero. Add those together and you get 10. Add 10 to 28 and 38 is almost the 40 that figured to come with the new additions to the program. Of course, sports — particularly at the Olympics — can often prove a matter of woulda, coulda, shoulda. For every medal the United States didn’t win, there’s one it surprisingly did — such as Andrew Weibrecht’s silver in the super-G, a reprise of his 2010 bronze in the same event. Some would suggest that the move to 28 from 37 is also tied to the increasing globalization of the Winter Games. In the men’s snowboard halfpipe, for instance, traditionally the province of White and other Americans, no U.S. man medaled; two Japanese and a Swiss rocked the podium. Then again, in Vancouver, 26 national Olympic committees won medals. In Sochi, exactly the same number, 26 NOCs, won medals. "The new face of Russia"
ADLER, Russia — The Sochi 2014 Winter Games drew Sunday night to a close, an Olympics intent on projecting the image of a strong and confident new Russia across this vast country and to the world beyond, with a mighty Russian team awakening the echoes of the mighty Soviet sport system to prideful spectator cheers of “Ro-ssi-ya! Ro-ssi-ya!” Albeit, over 17 days, to the beat of “Get Lucky” by a Russian police choir. And cheerful volunteers yelling, “Good morning!” while dancing to the Black Eyed Peas. 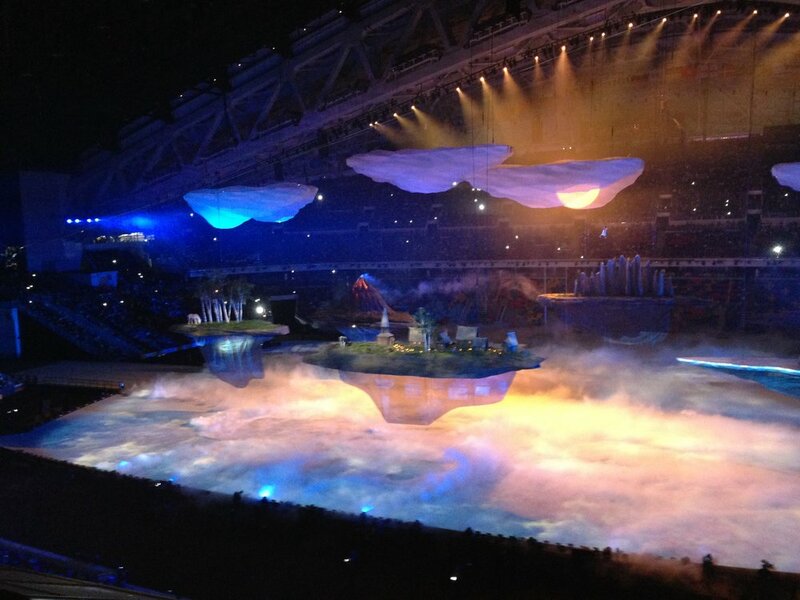 Putin's big "Dreams about Russia"
ADLER, Russia — In a ceremony entitled “Dreams about Russia,” the Sochi 2014 Olympics got underway, arguably the most controversial and contentious Winter Games in history, as much a referendum on modern Russia as celebration of the best in winter sports. “Welcome to the center of the universe!” Russian TV star Yana Churikova shouted to kick off the evening, touching off a show that veered through the centuries amid the strains of classical music, the thump of dance music and the crash and boom of fireworks that lit the night sky. As the Russian team made its way into and around Fisht Olympic Stadium, the place literally shook to a heavy bass beat. Television cameras showed Russian president Vladimir Putin smiling. Later, he would formally declare the Games open. And he would smile again. Irina Rodnina, the most successful pairs figure skater in history with three gold medals, and Vladislav Tretyak, arguably the greatest hockey goalie ever with three golds and one silver, together lit the cauldron. In much the same way that with the bang of 2008 drums China sought six years ago to announce its arrival onto the 21st century world stage, these 2014 Olympic Games were always going to be a defining occasion for Russia and, in particular, Putin. Bach: not a stage "to score points"
Obama is, of course, not here. Neither are the presidents of Germany or France. Then again, the heads of state of state or government of 52 nations are, believed to be a Winter Games record. Bach: "The Olympic stage is set"
ADLER, Russia — The 2014 Winter Games come at an anxious moment in our world, and these Olympics arrive attended by all manner of controversy, and so it was with intense symbolism that the new president of the International Olympic Committee, Thomas Bach, made his first appearance Monday at a formal news conference. The president made his entry into the huge conference hall from a door at the front, on the left. There would be no suit and tie. He wore a blue shirt and a cream-colored sweater. He bounded up the stairs, squinted into the bright lights, settled into his seat at the center of the dais and, relaxed, comfortable, confident, made clear he expects these Games to be a huge success. What would it feel like to have a spot on the 2014 U.S. Olympic team and then, selflessly, give it up? It would be easy. “Love,” Tracy Barnes said of giving up her spot on the U.S. biathlon team to her twin sister, Lanny, “is selfless dedication. Understand the numbers. The U.S. Census population estimate for the start of 2014: just over 317 million. The U.S. women’s biathlon team that goes to Sochi in just a few weeks: five. Essentially, by the time it got down to Sunday’s final qualifying race, there was one spot up for grabs. One in 317 million. For comparison, your chance of winning the lottery on a single ticket is one in 175 million. Really, Tracy Barnes said. It was easy. Tracy and Lanny Barnes are 31 years old. This is, probably, their last best chance at the Olympic Games. Biathlon is the ski-and-shoot combination. The United States has never won an Olympic medal in the sport. Many observers believe 2014 could well be the breakthrough year. The sisters didn’t get on skis, or even think about combining shooting and skiing, until they met a US Biathlon coach at a local competition. When they were 18, they made their first junior world championship team. Two years later, Lanny medaled at the 2003 junior worlds. Both made the 2006 Torino Games. At the time, they were 23. Lanny finished 64th in the 15-kilometer event, Tracy 57th. Tracy also came home 71st in the 7.5km sprint; the twins were part of the 15th-place U.S. finish in the 4x6km relay. In 2010 in Vancouver, Tracy did not qualify. Only Lanny. Her best individual finish: 23rd in the 15k. As the Olympic qualifying season unfolded, two of the five spots on the Sochi 2014 team were locked up early, dictated by results on tour. They went to Susan Dunklee of Barton, Vermont, and Annelies Cook of Saranac Lake, New York. Then Sara Studebaker of Boise, Idaho — like Lanny, a 2010 Olympian — and Hannah Dreissigacker of Morrrisville, Vermont, earned their spots. Dreissigacker clinched her spot with 18-for-20 shooting, and a 10th-place finish, at an IBU Cup event Saturday in Ridnaun, Italy. She and Dunklee grew up skiing together in northern Vermont. Thus it came down to Sunday’s racing, at that same IBU Cup in Italy. Sunday’s race: a 7.5k sprint. Tracy Barnes finished 10th. She shot clean — no penalties. That clinched it for the committee, which by rule had a discretionary spot — Tracy Barnes was not just the U.S. athlete with the next-best record over the qualifying period, she seemed to be peaking, and just in time for the Games. Before that race, Tracy had already made her decision. During the final four team-selection races, Lanny had been sick, unable to compete in all but one. Tracy knew the rules, her status and her sister’s, too — if she turned down the spot, Tracy knew Lanny had the next-best record over the entire qualifying period and thus would be the athlete the committee was all but sure to turn to. “For me, this decision was pretty easy,” she said again. “It’s a pretty heavy situation, I guess,” she said with a laugh. “I have been through a fair number of Olympic Trials in my career. I know they’re pretty brutal emotionally. I know there can be a chance where bad luck can on the side of an athlete. Just having watched Lanny through this week and how she even tried to race one race sick, that never works, even — especially — at the level we are trying to race at. After Sunday’s racing was over, the two sisters went for a walk -- actually more of a hike up into the mountains. There were tears. A lot. On both sides. From high in the Italian mountains, Tracy then called Max Cobb, the president and chief executive of US Biathlon, at his home in Vermont. He ended up having to call her back from a landline. The cell reception was scratchy. Even so, he understood. “I can’t even begin to describe," Lanny Barnes said, "what it means to me that Tracy made such a huge sacrifice for me. Now that the U.S. State Department has issued a travel advisory to Americans that all but screams don’t go to the 2014 Winter Games in Sochi, you have to wonder: Why is the U.S. government taking such a contrary position about these Olympics? And what will be the consequences? For any travelers who do go? For the U.S. team? The U.S. Olympic Committee? Longer-term, for the prospect of an American bid for the 2024 Summer Games — the International Olympic Committee tending to have a long memory about governments that don’t play ball the Olympic way, especially when it’s the American government. The State Department does not always issue travel alerts; it does so to “disseminate information” when the U.S. government identifies “short-term conditions” it believes “pose significant risks to the security of U.S. citizens.” The government issues “travel warnings” for more serious situations in which it urges Americans not to go. In this instance, one wonders whether the distinction makes a difference, given the publicity the advisory generated — Associated Press, the New York Times and other major outlets — and the language it contained. The advisory also runs the considerable risk of putting the USOC — and, worse, American athletes — in an awkward, or worse, position. At the 2014 Games, the USOC has to rely on the State Department, some number of FBI agents and other American assets but, mostly, the Russians themselves for security. In Sochi, the U.S. team will also be largely at the Russians’ disposal for logistics and transport. To be clear, since the attack by Palestinian terrorists on Israeli athletes and coaches at the 1972 Munich Games, security has been priority No. 1 at the Olympics, Winter or Summer. Further, at any edition of the Games, the Israeli and American teams always get special security attention. All of life is a relationship business. One has to hope the relationships the Americans have forged and cultivated with their Russian colleagues at the staff level will now carry on without disruption through the 2014 Olympics. Everyone, and especially President Obama and the State Department, knows full well the Sochi Games are a prestige project for Russian President Vladimir Putin. The issue is whether the White House and State Department have, indeed, fully thought out the consequences of their approach. The advisory comes weeks after President Obama announced the White House delegation to the Sochi Games would not include any senior political figures but would include notable gay athletes, including Billie Jean King. Last week, Olympic insiders were being told there was no State Department advisory. Then late Friday, one appeared, in two parts, the alert itself and a corollary Sochi Games fact sheet. In sum, the State Department cautioned Americans that terrorists have threatened attacks on the Games. It expressed concern about the scope and nature of medical care in the region. It also drew attention to the Russian law passed last summer that purports to bar “propaganda” aimed to minors about nontraditional sexual relations. As for attacks around Russia over the past “10-15 years”: really? If that is the standard, what about the 2012 Games, and the bombings that shook the London transport system in 2005, literally the day after London won the right to stage them? If that is the standard, what about any of the horrific episodes of mass murder by automatic weapon in the United States over the past decade? In Connecticut? Colorado? Texas? Should those prompt warnings to Russian tourists not to visit anywhere in the United States? The alert expressly notes it is unaware of any specific threat to U.S. interests related to the Games. The opening ceremony is set for Feb. 7. Connoisseurs of irony might find that delicious, of course. Here are the Americans, caught up in a long-running controversy with the Russians over the former intelligence contractor Edward Snowden and the National Security Agency, warning Americans who might be traveling to the 2014 Olympics that Russian law permits the collection of virtually anything and everything. This even as the Kremlin was announcing the very same day -- of course, Moscow is several hours ahead of Washington, so you'd think the State Department would be on it enough to notice -- that political demonstrations would be allowed during the period of the Games at a specially designated site in the village of Khost, about seven miles from Olympic sites. To use the site, activists must secure a special permit from the authorities; the police assuredly will be on hand. Then again, you generally have to get a permit for a rally in the United States and, typically, the police show up, too. Who knows whether, as in Beijing in 2008, the site may go relatively unused? The fact is, it has been made available. Here is a call on behalf of all people of good will to nothing bad happening. Here’s also to the Russians winning, or at least winning a medal, in one of the very first events of the Games, the men’s 10-kilometer sprint in biathlon, due to start at 6:30 p.m. on the first Saturday of the Olympics, Feb. 8. Nothing will take the focus off security and everything other issue as much as the home team winning; biathlon, the ski-and-shoot double, is one of Russia’s national sports. To be blunt, the Russians are not likely to win boatloads of medals in Sochi, and they already know it. So one here would go a long way toward a good mood. It is absurd, far-fetched indeed, to come all the way back from a world-class knee injury in under a year when you must comply with Olympic-style drug-testing protocols. Four years ago, at the Vancouver Games, Vonn became the first American woman to win the Olympic downhill. In an announcement she posted Tuesday to her Facebook page, Vonn said she was “devastated” she would not compete in Sochi. Last February, at the world alpine ski championships in Austria, Vonn tore two ligaments in her right knee and broke a bone in a spectacular fall. In November, she crashed again; that tore the surgically repaired ACL. In December, she sprained her MCL during a downhill in Val d’Isere, France. Vonn also said she is having surgery now in a bid to be ready for the 2015 alpine world championships in her hometown, Vail, Colo. Since no one works harder, she will — barring any more setbacks — be ready. Vonn was widely expected to be the biggest star on the U.S. team in Sochi. She — like short-track speed skater Apolo Ohno in 2010 — is one of the few who have crossed over from the comparative anonymity of winter sports to become a mainstream celebrity. And then there’s the whole Tiger Woods thing. That said, the U.S. alpine team should still be very, very good. Ted Ligety is the best giant-slalom skier in the world, and won three golds at last year’s alpine world championships. Bode Miller is simply the best male skier the United States has ever produced and, after taking last year off, has shown signs of coming back strong this season. All six of the women on the U.S. “speed” team — that is, downhill and super-G — finished one, two or three in a World Cup event last year. Teen Mikaela Shiffrin is last year’s slalom champion. Julia Mancuso has not had a top-10 finish this season, true, but does have three Olympic medals and a track record of consistently rising to the pressure of the big stage. The U.S. alpine team won eight medals in Vancouver. Vonn won two, that downhill gold and a super-G bronze. Would she have won medals in Sochi? Was the U.S. Olympic Committee counting on Vonn in its medals calculations (which it insists it doesn’t do)? Again, realities here. Same deal with Evan Lysacek, who won gold in men’s figure skating in Vancouver but hasn’t competed since. Do you really, seriously think the USOC was counting on him to win in Sochi? When he bowed out a few weeks ago, did that alter anyone’s projections? The U.S. Ski Team — everyone from the Nordic combined guys to snowboarders to the alpine racers — won 21 medals in Vancouver. Overall, the U.S. team won 37. That topped the medals table. In Sochi, the U.S. team could legitimately figure, conservatively, to win 30. Aggressively, 40. In Vancouver there were 24 snowboard and freeski medal opportunities. In Sochi, 48. These are the actions-sports events in which Americans typically rock. In Vancouver, moreover, the Americans didn’t win even one medal in cross-country or biathlon. To return to football, as it were: it is an enduring football cliche that when one guy goes down, another steps up. Shaun White, who threw the Double McTwist 1260 to win gold in the snowboard halfpipe in Vancouver, has now added another 180 degrees of twist. The thing is now called a Frontside Double Cork 1440. A simple explanation: the winning run in Vancouver was two flips and three and a half spins. White has now added another half-revolution of twist inside the two somersaults. The U.S. women’s cross-country team, led by Kikkan Randall, stands ready to win its first-ever Olympic medals. The Americans haven’t won a medal of any kind in cross country since Bill Koch in 1976. America, meet Nick Goepper. He is 19 years old, 20 in March, and does slopestyle — skiing, not boarding. (White does it boarding as well.) Slopestyle is when you navigate a course filled with rails, jumps and other obstacles and do tricks for amplitude and style points. Did you know you can become a champion slopestyle artist from Lawrenceburg, Indiana? Growing up on a hill with a vertical drop of all of 400 feet? Goepper won gold at the X Games in Aspen last January. On Dec. 21, Goepper became the first skier to grab a spot on the first-ever U.S. freeski Olympic team by virtue of his second-place finish in a Grand Prix slopestyle event at Copper Mountain, Colorado. The third of five Olympic qualification events gets underway Wednesday and runs through Sunday in Breckenridge. When he qualified for the Olympics, Goepper was naturally asked about it. The thing is, every Olympics produces its own history. One of the new realities of the 2014 Olympics is that slopestyle — in both its board and ski iterations — is poised to explode in super-fun on television screens, tablets and cellphones across not just the United States but the world. It won't be the same without Lindsey Vonn in Sochi. But she would be the first to tell you — it’s not all about her. One more reality: it never was.